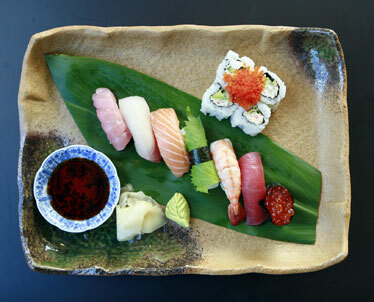 The nigiri sushi platter at Kyoto Ohsho is symbolic of the new wave of Japanese restaurants to hit town in 2007. It was an exciting year in restaurants, one in which we saw a lot of grand openings, sad goodbyes and a whole lot of dishes from the land of the rising sun. Let's savor the past. Spring saw a spate of back-to-back grand openings, including Cassis, Nobu, Stage and a revamped Epic. More than a visitor destination, Waikiki Beach Walk also drew locals out to stroll while checking out diverse grinds from initial dining tenants Yard House, Roy's Waikiki, Holokai Grill and Mondo Gelato. Taormina Sicilian Restaurant, Honolulu's second Ruth's Chris Steak House and Giovanni Pastrami soon followed. At year's end, the Beachhouse joined the party, bringing steak and seafood to the Westin Moana. Downtown Honolulu always sees small eatery foot traffic, but a couple of main attractions for outsiders were downtown at the Hawaii State Art Museum and Mix Cafe for fans of upscale casual fare. And there was a taste of something new as Dat One introduced fast-food Persian plates to a hungry lunch crowd. 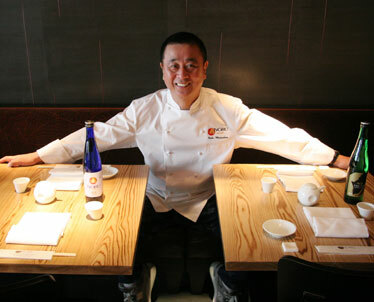 Say hello to Nobu Matsuhisa and his Nobu Waikiki, which joined the list of new upscale dining choices. Master of the Massive Plate Lunch Paul Masuoka closed the doors to his Liliha Street diner in March, retiring after 34 years of serving his family's famed laulau, teriyaki chicken and other massive plates. Those who love Chinese tea cookies and moon cakes were saddened when Shung Chong Yuein baker Shing Yuein Ng retired, closing his 45-year-old Maunakea Street pastry shop in May. Closings came suddenly for the Bistro at Century Center, Columbia Inn Kaimuki and Onjin's Cafe. TGI Friday's also closed its doors, leaving the Blaisdell crowd without a nearby haunt before and after shows. We also said goodbye to Helen Chock, the face and personality behind Helena's Hawaiian Food, who died in July. The humble and diminutive restaurateur opened her business in 1946, and in 2000 was nominated by the Star-Bulletin and recognized as a Regional Classic by the James Beard Foundation, a special designation created for locally owned, neighborhood eateries that best reflect the character of their communities. 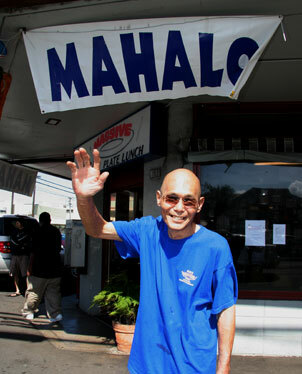 Aloha meant goodbye for Paul Masuoka of Masu's Massive Plate Lunch. China might be making all the economic headlines these days, but in 2007 it was the year of the Japanese restaurant in Honolulu. As much as I love to change it up and vary cuisine coverage from week to week, at a certain point it seemed near impossible to avoid reviewing a Japanese restaurant. That's all there was, folks! In January we celebrated the new year with noodles from Matsugen and feasted at Kyoto Ohsho's buffet. Later in the year, after delays, Tsukiji Fish Market emerged to compete with its Ala Moana Center neighbor. The sushi restaurant Goldfish came and went, but Gaku Sushi Izakaya later turned out to be a keeper and, along with Kaiwa, among my favorite new restaurants of the year. Yes, I liked Nobu as well, but it's not a place I could afford too often. And late in the year, Wasabi Bistro partnered with Japan's Nadaman restaurant empire to form Wasabi & Nadaman. The rising cost of wholesale food, rents, fuel and utilities were reflected in the higher cost of dining out. On the low end, Preston Chun of R&P's Cafe and Catering at 933 N. King St. lamented the need to raise his already low breakfast and plate lunches by about 25 cents. But diners said enough is enough when the average prices of Palomino were replaced by Cassis lunch entrees running $25 to $28. Yes, those prices fly when you're Balthazar, or any other brasserie in New York, but let's not forget the local tendency toward thriftiness when plate lunches hit the spot just as well at noon for $8 or less, the notion being that food is fleeting to most people. While I believe in paying for the experience, like a grand show, the nonfoodie consensus was summed up for me by a woman I happened to sit next to at a dinner party, who said, "I'd rather buy a Louis Vuitton purse than spend the money on food." Ouch. By fall, Cassis had introduced a more reasonable Wikiwiki menu. Industry leaders are expressing "cautious optimism" about the year ahead, but I see a lot of competition out there without as much of the home equity spending of the past few years. Restaurateurs are going to have to be smarter about delivering not what they want to produce, but what people want. One thing we want to see is something new. Dave Stewart is on the right track with his plans to open Rhumba. If the Caribbean fare is halfway decent, it's sure to be a winner. Downtown started on the right track with its First Friday tapas. I'd like to see a couple of tapas bars open for good. I mean, when staid Washington, D.C., can have a trio of tapas bars, that really shows how far we're lagging. Another sign of lag is the short shrift given to vegetables on menus. Where the nation's top restaurants have offered vegetarian prix fixe menus for at least a decade, nothing of the sort exists here. It is possible to be creative with root vegetables and crucifers, and it would be wise for chefs to learn to use them. A new generation of vegetarians and ethical eaters is coming up and will demand it, as will aging Baby Boomers with health concerns. More niche dining is another way to go for small fry. I see too many startups trying to offer smorgasbords when they might be good at only one thing. Remember "City Slickers." Find your one thing. Don't let the rest bring you down.